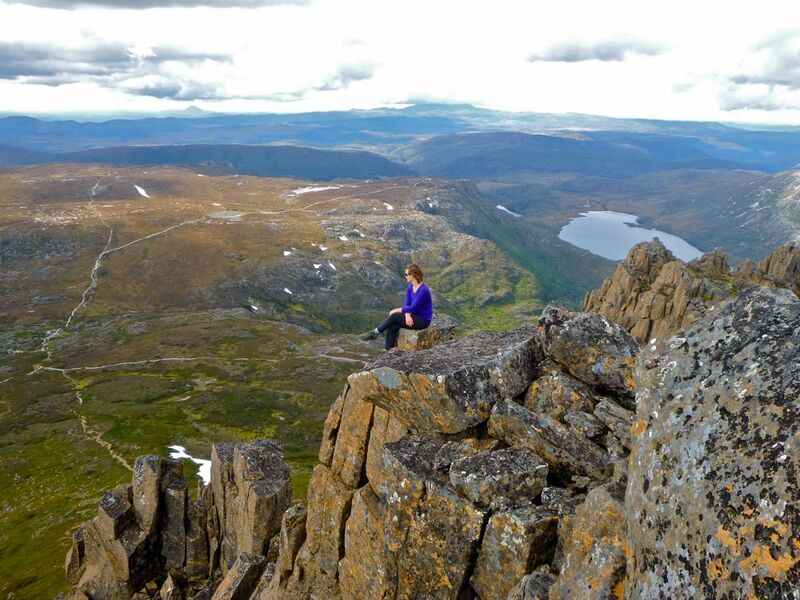 I set off on Saturday, November 16th, on a 100km hike through some of the most pristine wilderness in the world: The Tasmanian Overland Track, a World Heritage Area on an exposed plateau known for its remote and rugged beauty. I’ll admit to not researching much beyond that- I paid the $200 reservation fee, bought a map, packed my bag and was off. Day 1: We hit the trail late in the day, around 3pm. The recommended start time is no later than 2pm, so we hustle along as quickly as my 38lb pack would allow. The initial terrain is easy; a wide and well maintained boardwalk undulates across the Ronny Creek Buttongrass moorlands, near 900 meters in elevation. After an hour, the terrain changes sharply as we climb the Cradle Plateau, topping out at nearly 1300 meters in the windswept alpine area. We still have a couple of hours to hike before reaching our destination for the evening, but we can’t leave without first climbing Cradle Mountain, the first in a series of jagged peaks. Missing the turn to the true summit, we find ourselves scrambling hands and feet through a scree field on much steeper and harsher trail, heading straight up to Smithies Peak, instead of diagonal to the true summit, 18 meters higher. We climb and scramble along the ridgeline, and happy with our viewpoint, head down and continue on to Waterfall Valley Hut, where we’re fortunate to share with only one other person, a Search and Rescue volunteer. 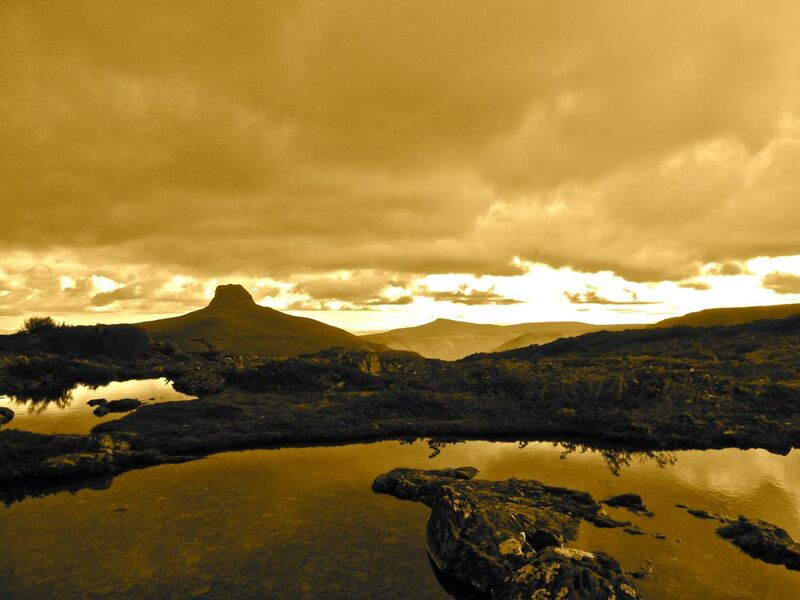 Highlights: Climbing Cradle Mountain and having sweeping views of the landscape to come. Seeing my first-ever leech, attempting to find a good spot to dine on my sandaled foot. Note to self: no more flipflops. Day 2: At the wee hour of 9am, we backtrack uphill 30 minutes to the trailhead for our 2nd mountain summit, Barn Bluff, looming in the distance at 1559 meters. I estimate a round trip ascent of 4 hours, and Tom guesses 6. We complete the hike in 3 hours and 50 minutes, before hiking the 3 hours to our next camp at Windermere Hut, with a stop at Lake Will to bathe on its sandy shores. 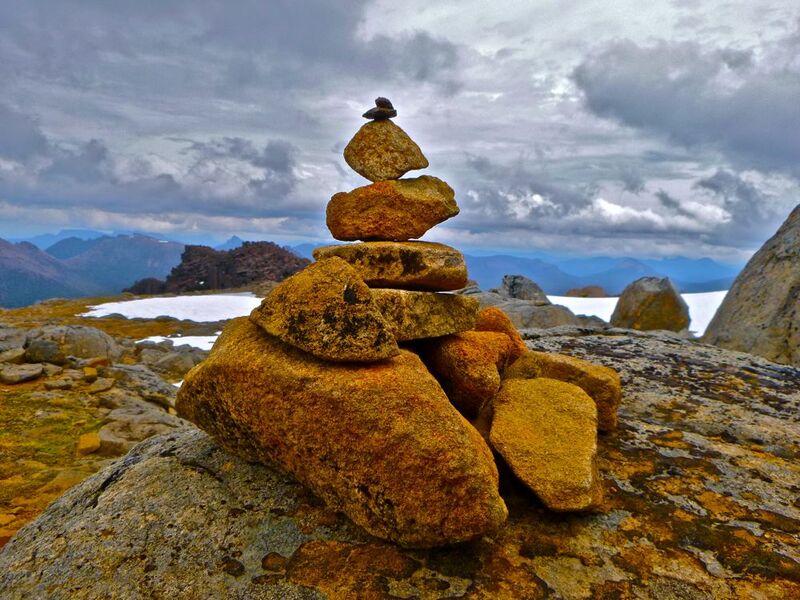 Highlights: Viewing Cradle Mountain and Lake Will’s white quartzite sand beaches from above, fringed with pencil pine. Something sniffs food in our tent, and makes its way under the rain cover to the mesh lining of the tent. I turn my headlamp on to find myself nose to nose with an opossum. I see him, he sees a bright light in his face. We hold each other’s gaze, and then he’s off into the night. We hike 16km to New Pelion Hut, and not having had enough, we make lunch and start the long hike through more Buttongrass marsh riddled with deep water holes, leeches and streams to the wooded foot of Mount Oakley. On hands and knees we crawl upwards through dense palm forests with sharp cutting fronds until we reach the rocky alpine plateau above the bog. We’re back in time for an 8pm couscous and falafel dinner and an early night’s sleep. 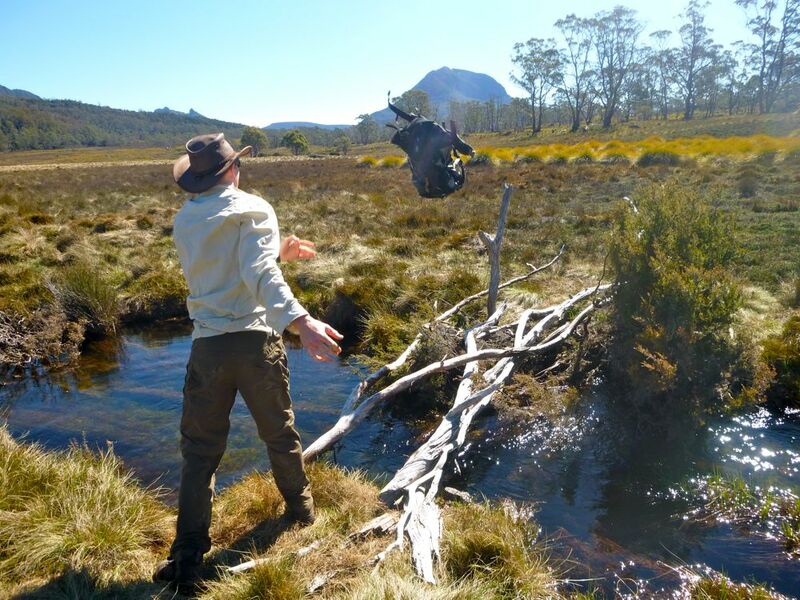 Highlights: Experiencing Tasmanian swamp. Attempting to swim in a meter deep, meter wide stream winding its way through the Buttongrass bog. Pants-less, I gazed into the clear water surrounded by thick grass, wondering aloud how many leeches might exist in this one spot and if it was really worth it. Tom peels a sock off to find a fat blood-filled leech stuffed and sedate. I find another crawling up my foot. We make a quick retreat back to camp. Day 4: Exhausted, I stagger up to the Pelion Gap area with an upset stomach. Don’t believe them when they tell you you don’t have to purify the rain barrel water. Take extra precaution and use iodine tablets or a water pump. 10 minutes of rest and we’re on another side trail, leading to the summit of Mount Ossa, Tasmania’s highest peak at 1617 meters. 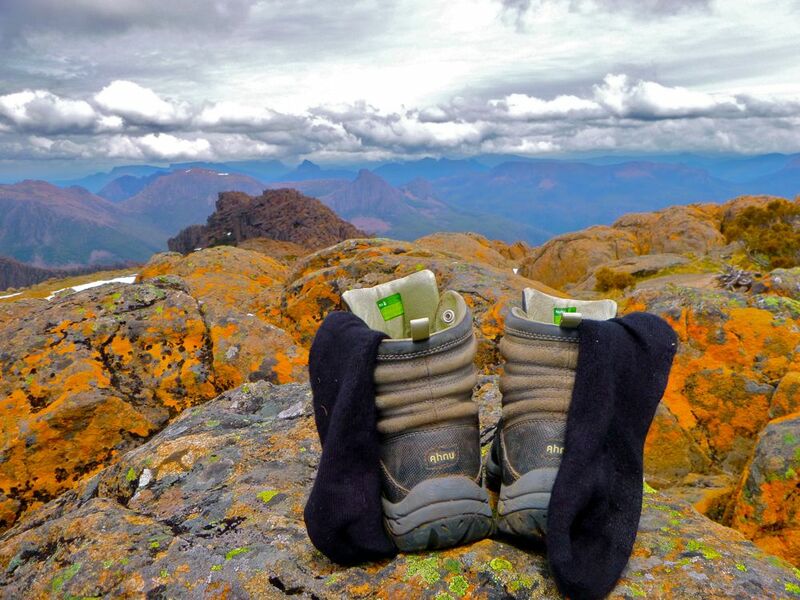 It’s a long steep slog through mud and snow, but the extra effort is well worth it. Highlights: Views of the entire plateau at the summit of Mount Ossa, including the three previous mountains we climbed. Being called “super heroes” by a group of 4 Australians and a German lagging many hours behind, around our age, struggling up the mountainside as we bounded happily down. Taking a bird bath on the bank of the freezing Kia Ora Creek, feeling alive and refreshed, alone in the woods. Debating which gets precedent to hang in our tent: my clean undies (the one I dunked in a cold river), or Tom’s manky socks. The debate rages on. Day 5: Another long-ish day from Kia Ora Hut to Bert Nichols Hut (10km) and then on to Narcissus Hut (9km). 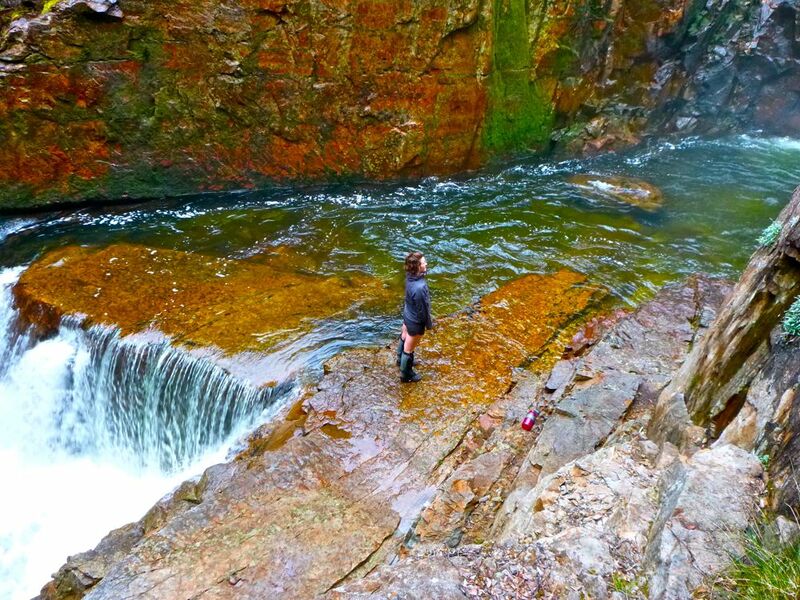 No major side trips possible save for 3 lovely waterfalls we’re glad we didn’t skip. Another day of stomach upset. “Highlights”: Code Orange stomach problems! Seeing a leech crawl towards me as I try and find a woodside bathroom spot. Do they have eyes? Tom spots a platypus in the Narcissus River, right in front of our tent. Day 6: Our last day on the trail takes us from Narcissus Hut to Echo Point Hut (6.5km) and then to Cynthia Bay (11km) on Lake St. Clair through poorly maintained swampy trail. This section is the most deserted. Most hikers take a small ferry-shuttle from Narcissus Hut back to the visitor’s center. Echo Point hut is the smallest and most rustic of all the huts, and by far my favorite. Seeing more food at the end of the tunnel, we finally eat the Snickers bar I’ve been carrying for 100km. Highlights: Perfect weather turned to dumping rain just as we entered the visitor’s center at Lake St. Clair. The timing couldn’t have been better. Now the adventure really begins: How are we going to get back to our car?? Fantastic photos!! So glad you missed the horrible weather. Sounds wonderful. Beautiful pics! Funny that Tom’s hair is the exact same color as the stuff all over those rocks! Did you use a filter? Your hair looks a little orange too! Beautiful photos! 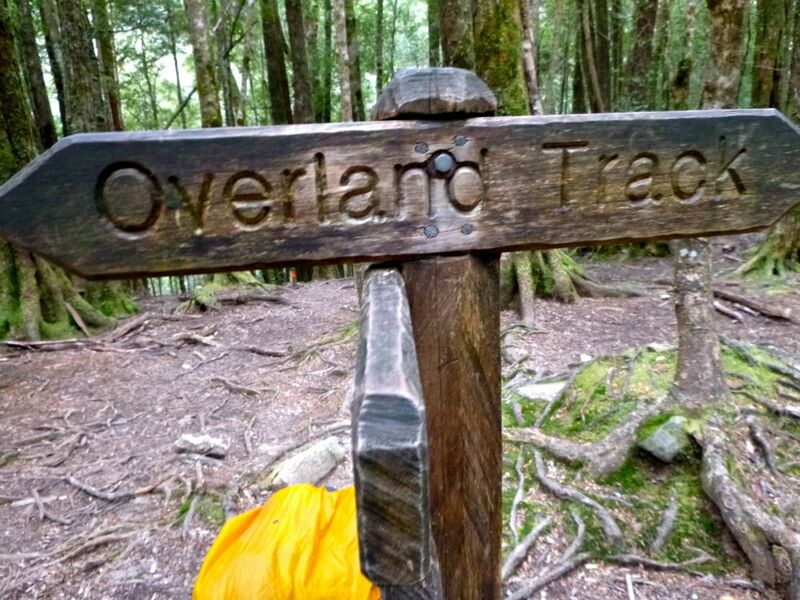 I was just looking through all the Overland Track posts and this must be one of more visually attractive ones. I did this in September last year, and you have to admit, its’ pretty amazing. Looks like you had great weather when you were there!